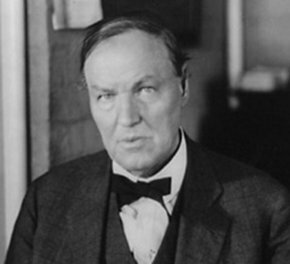 Originally from Ohio, Clarence Darrow moved to Chicago in 1887. He became a famous lawyer and a specialist of criminal law. In 1924, one of his cases involved the rich kids Richard Loeb and Nathan Leopold, who had kidnapped and murdered 14-year-old Bobbie Franks just for kicks. Darrow was hired to defend Loeb and Leopold and managed to turn an imminent execution sentence into an actual imprisonment verdict. His defense, arguing against capital punishment, became somewhat famous. Here is Darrow's closing argument, The Book of Love. Go here for all things Illinois vs. Leopold and Loeb. Then there were the Sweet Trials of 1925 and 1926. When a white mob attacked the house of the black Sweet family on September 9, 1925, one of the occupants, 22 year-old Henry Sweet, allegedly fired a bulled that killed one of the attackers, Leon Breiner. The National Association for the Advancement of Colored People (NAACP) hired Clarence Darrow for the defense. On May 11, 1926, Darrow had a strong cup of coffee, took a deep breath, and delivered his 7 hour closing argument, The Law of Love. On May 13, 1926, the all-white jury found Henry Sweet not guilty. Go here for all things about the Sweet Trials 1925 & 1926.